Stonewall Apiary is a family-owned apiary based in Hanover, Connecticut. 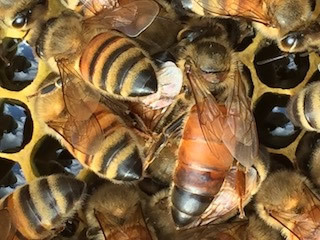 We keep approximately 275 honeybee colonies in the eastern Connecticut area. We focus on the health of our bees, knowing that healthy honeybees are better producers than unhealthy ones. We sell honey, creamed honey, comb honey and chunk honey in various sizes. In addition, we also have honey and beeswax products such as honey butter, beeswax candles, beeswax wood polish and an exfoliating honey sugar scrub. For more information, see our Online Store. We are at the shop at 120 Inland Road, Versailles, CT every Thursday from 2pm to 5pm. We can also schedule a time to meet. And if you drive by and there is a vehicle in the parking lot, feel free to stop in!